pete you are the best teacher i have ever seen on earth…God bless you so much. pls annswer dis question pls…what of if you get a high volume and the the no supply comes up close to ur fibbs…50.0-68 retracement level do you still buy? Thanks, and good question. Let’s say we are looking at a markup that has retraced down to this fib “zone”, looking at the 5 min for entry. First thing we know is, a NS entry wouldn’t be very close to the 61.8 level since we would need to see stopping volume there, no close below 61.8, and price to move [I]away[/I] from the low first. So the question is, is a NS valid within this zone? Sure, that’s a trade I’ll take. In my experience, waiting for price to get back OUT of this zone before entering is probably slightly safer. Just note, it’s always best to see a general increase in volume maintained as long as price is in this zone to suggest a bounce…besides the NS/ND candles of course. Typical target on a fib bounce is up to 0 fib, but you know how I do it. See the reaction there, if there is supply bank some and lock BE or trail. In this case supply was shown, so I would have. Also, if you draw a simple line on the up move from yesterdays low to measure it. Then, move that line to the bottom of the retrace point today, you get a symmetrical target of 1.3850…I think I’ve shown you that trick. That also correlates with yesterdays high (resistance), so it would have been TP2. So for the past week I have been even. :28: Its all about psychology from here on in for me. 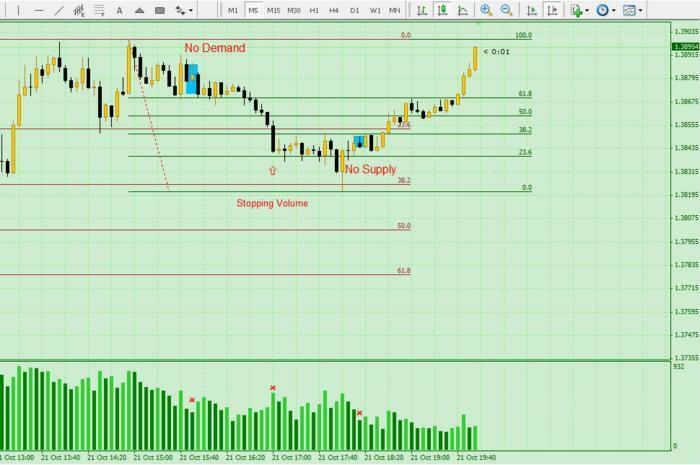 The 1hr chart phase day to day/intraday, fibs and supply/demand areas is home base. The 5 min is used for entry when they line up. There is nothing in my particular method that would be of help trading week long swings. I wouldn’t try to mix up the two until you grasp what I’m doing here. so i have been finding that every day is a new day to trade. 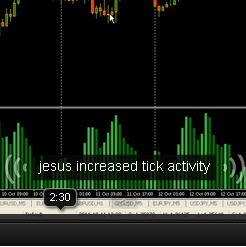 hence the intra-day trader thing. I find I am having trouble distinguishing between looking for a longer term move (say a week) and simple looking for the accumulation/distribution phases every new trading session. Tough to pick out long term moves anyway at the moment. The market appears to have mislaid its anti-schizophrenic pills and is all over the place. Probably easier to key off the intraday moves for now. What is the best time to exit from the trade? Price hits Fibonacci lvl 50-61.8 very often. But in this case some up strenght has shown up? What is the best to do in this situation? 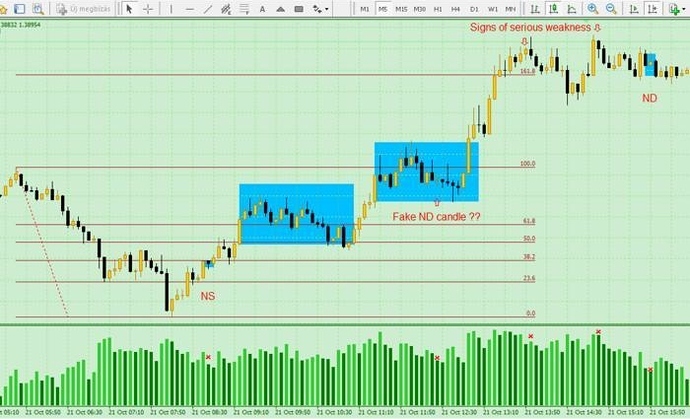 Second thing: could it be possible to trade from a ND candle to a NS candle and vice versa? Sorry if this is a dumb question. Thank you for your answers in advance. I am glad to be a part of this great thread. Should I draw from up to down in this case? or both? Let’s not go down that road. I put my pants on one leg at a time just like everybody else. Only diffrence is once my pants are on…I make a fortune. HAHA, just kidding…sometimes I don’t wear pants. Hey Pete, Any new vids coming up soon? This is good, aside from the time of day. This is the most basic, and most safe VSA setup. 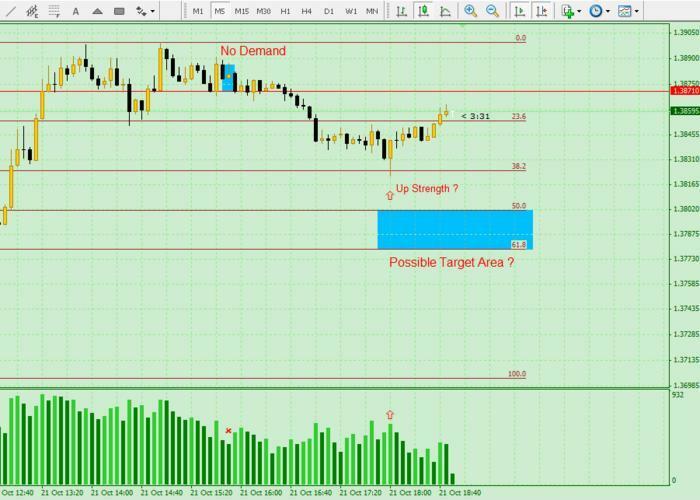 Trading it with the phase, fib, s/r, trend lines from the 1hr in mind and you have yourself a proven method. From there you can expand and learn other entries of course. BTW, when it’s at the top, instead of stopping volume, we call it a “buy climax” …it’s essentially the same thing. Maybe I’ll make part 3 this weekend. I’m thinking it should cover how to go about the analysis to start the session as far as fibs, s/r and trend lines, so you know where to look for setups in advance and which direction is safer to trade. Sounds really good! Looking forward to it! I spent some time back analyze the chart and found this. My question is the following: How can we “survive” those rebounces marked with blue rectangle? Also, please check the fake no demand candle. I am open for your thoughts. Could it be a sign of a buying climax in the second triangle followed by the fake no demand candle?